Mosaic freshwater landscapes exhibit tree-dominated patches —or tree islands—interspersed in a background of marshes and wet prairies. In the Florida Everglades, these patterned landscapes provide habitat for a variety of plant and animal species and are hotspots of biodiversity. Even though the emergence of patchy freshwater systems has been associated with climate histories, fluctuating hydrologic conditions, and internal feedbacks, a process-based quantitative understanding of the underlying dynamics is still missing. Here, we develop a mechanistic framework that relates the dynamics of vegetation, nutrients and soil accretion/loss through ecogeomorphic feedbacks and interactions with hydrologic drivers. We show that the stable coexistence of tree islands and marshes results as an effect of their both being (meta-) stable states of the system. However, tree islands are found to have only a limited resilience, in that changes in hydrologic conditions or vegetation cover may cause an abrupt shift to a stable marsh state. The inherent non-linear and discontinuous dynamics determining the stability and resilience of tree islands should be accounted for in efforts aiming at the management, conservation and restoration of these features. PD-Conceived and designed study, performed research, contributed new models, wrote the article. VE-Conceived and designed study, performed research, analyzed data, wrote the article. JC-Conceived and designed study, performed research, contributed new models. SO-Performed research, analyzed data. MR-Performed research, analyzed data. JS-Performed research, analyzed data. Support from the National Park Service (Everglades National Park #H5284080004) is gratefully acknowledged. This manuscript has greatly benefited from comments provided by Dr. Laurel G. Larsen and Dr. Judson W. Harvey, an anonymous reviewer, and the subject editor, Dr. Donald DeAngelis. Borgogno F, D’Odorico P, Laio F, Ridolfi L. 2009. Mathematical models of vegetation pattern formation in Ecohydrology. Rev Geophys 47:RG1005. doi: 10.1029/2007RG000256. Kwon H-H, Lall U, Moon Y-I, Khalil AF, Ahn H. 2006. 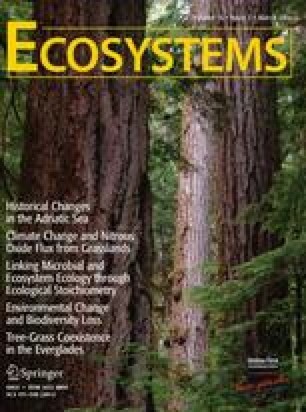 Episodic interannual climate oscillations and their influence on seasonal rainfall in the Everglades National Park. Water Resour Res 42:W11404. doi: 10.1029/2006WR005017. Lago ME, Miralles-Wilhelm F, Mahmoudi M, Engel V. 2010. Numerical modeling of the effects of water flow, sediment transport and vegetation growth on the spatiotemporal patterning of the ridge and slough landscape of the Everglades wetland. Adv Water Res. doi: 10.1016/j.advwatres.2010.07.009. Larsen LG, Harvey JW. 2010. Modeling of hydroecological feedbacks predicts distinct classes of landscape pattern, process, and restoration potential in shallow aquatic ecosystems. Geomorphology. doi: 10.1016/j.geomorph.2010.03.015. Richardson CJ. 2009. The Everglades: North America’s subtropical wetland. Wetlands Ecol Manage. doi: 10.1007/s11273-009-9156-4.